No single movie can explain a man’s life. Nevertheless, it’s extremely telling that Donald Trump’s favorite movie is Citizen Kane, Orson Welles’ masterpiece about “America’s Kubla Khan.” If there’s anyone in the country who could find real, personal resonance in the film—as opposed to viewing it as a cautionary parable; its original title was the more overt American—it’s Trump. The film’s opening newsreel reports that Kane “spoke for millions of Americans, [and] was hated by as many more.” That description applies just as readily to Trump, whose candidacy resonates strongest with those alienated by the political process—those who felt no one was speaking for them. Early in the film, we see Kane derided as both a communist and a fascist; while the former charge hasn’t been levied against Trump (though it wouldn’t be surprising for one of his GOP rivals to do so, given his old statements in favor of universal healthcare), the latter has—repeatedly and not hyperbolically. Trump and Kane react to losing an election. The differences between Trump and Kane arise in what the two men would do if elected, and whether that would be any good for the country (or New York State, in Kane’s case). Viewers of the movie don’t get a lot of specifics about Kane’s platform, but given his independent campaign occurred in the Progressive Era, it seems safe to assume that his candidacy was centered around worker-friendly reforms and a pledge to ferret out government corruption. He’s described as a “fighting liberal, the friend of the workingman,” a label that would be hard to affix to Trump, even though he draws most of his support from a lower-income and less-educated constituency. Kane’s “shameful, ignominious” defeat—he evidently feels the same way about losers that Trump does—is said to “set back for 20 years the cause of reform in the U.S.” That line suggests Kane would have been a strong public servant. Meanwhile, Trump’s campaign is seen as frankly dangerous; his losing would obviously not be seen as a regressive disaster. That he’ll do all he can! This all comes in stark contrast to current conservative dogma, which holds deregulation as the one-size-fits-all solution to all economic issues and is heavily intertwined with the interests of big business. Trump admittedly isn’t bound by the orthodoxy of his adopted party, but his tax plan, at least, indicates more sympathy for management than labor. Trump’s key election issue is the idea that America is sliding into decay; his takes on immigration and the economy all stem from this. In his view, other countries are unacceptably laughing at our weakness, as seen in the opening lines to a song played at one of his campaign stops. There’s also the issue of Trump’s history of racist and sexist comments, perhaps the key fact of his campaign, given how much of his popularity appears derived from his attitude and persona rather than his policies. 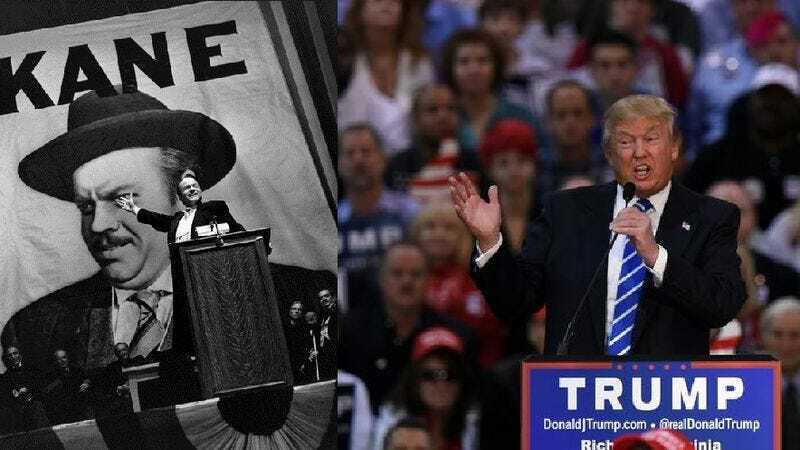 (Circus though this election season has been, articles linking Trump to a rise in white supremacist interest have been a sobering reminder of what rhetoric means outside of soundbites). Race or gender are not themes of Citizen Kane—like most Hollywood films of the era, it is basically all-white—but it’s hard to imagine Kane making statements that are in any way similar to Trump’s. One version of the script has a character describe Kane as “tolerant,” adding, “‘Live And Let Live’—that was his motto.” The line doesn’t appear in the film, but would be consistent with Welles’ portrayal of the character he wrote. Still, it shows character when Kane publishes critical items against a company he owns shares in, and he demonstrates a warped kind of integrity when he writes a scathing review of his wife’s opera debut. I’m not sure there’s an equivalent story to be told about Trump, who, for all his “telling it like it is” braggadocio, comes off as an opportunist more than an idealist. After losing the election and losing much of his empire in the Depression, Kane retreats to Xanadu, where he then proceeds to lose his wife and all his friends. He spends his final days alone, pitied but not loved. It’s a fate he brought on himself, though he retains enough of his idealistic youth that there’s a reason “Rosebud”—a cryptic reference to purity and innocence—is the final word to pass his lips. If Donald Trump fails to win the primary or general election, does a similar fate await him? Already high-profile extensions of his brand—his TV show, his deal with Macy’s and Univision—have dissolved, poisoned by how toxic he’s become with the broader public. [Note: The A.V. Club​ is owned by Univision Communications.] Rifts can be mended when there’s money to be had, of course, but it’s difficult to see why businesses would choose to associate with him when they could opt for other public figures who don’t have his baggage. When Trump analyzed Citizen Kane with Errol Morris, he singled out the famous breakfast montage as a meaningful moment in the film for him. As Kane gets more powerful, his relationships with those around him grow more strained. “Perhaps,” Trump said, “I can understand that.” Will Trump Towers become their own type of Xanadu? What would his last word be, and mean? And will anyone be there to listen?